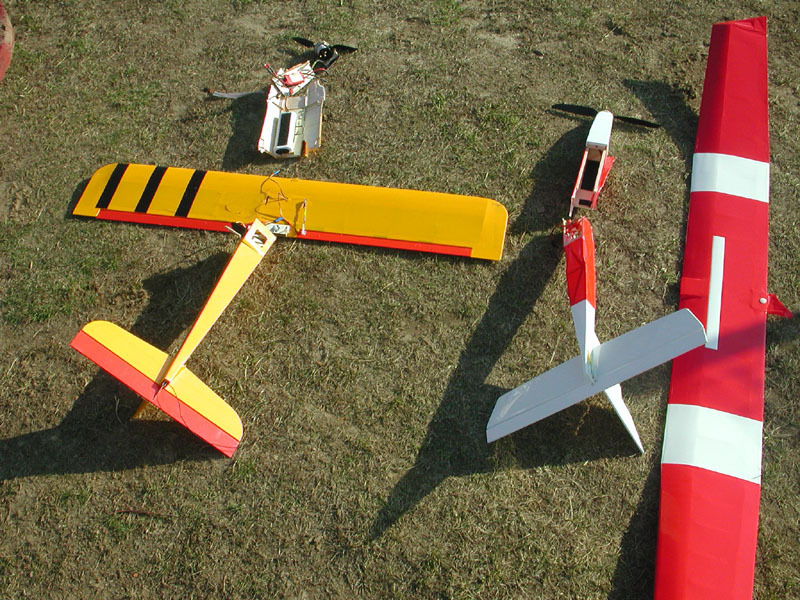 Had two flights on the new Soarwatt. On the second one, when landing a gust of wind flipped the plane over on touchdown and cartwheeled it along the runway. 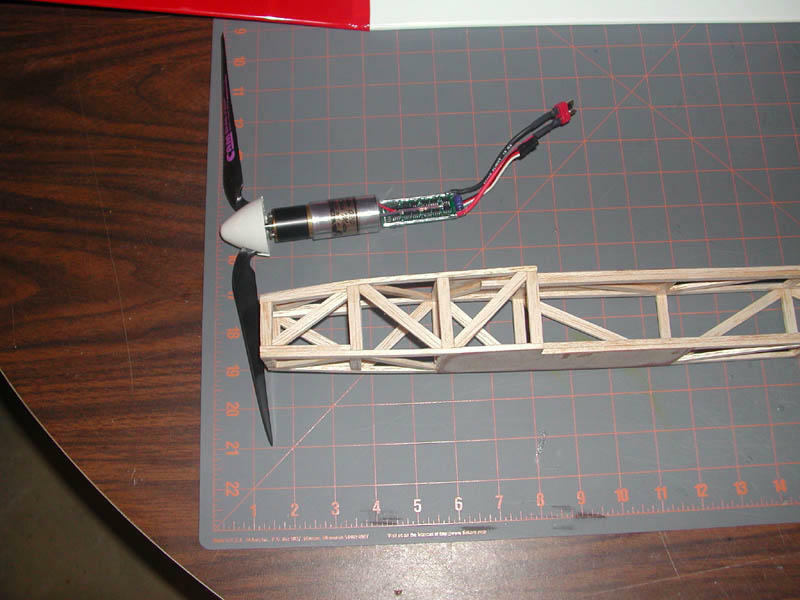 Destroyed the fuselage. 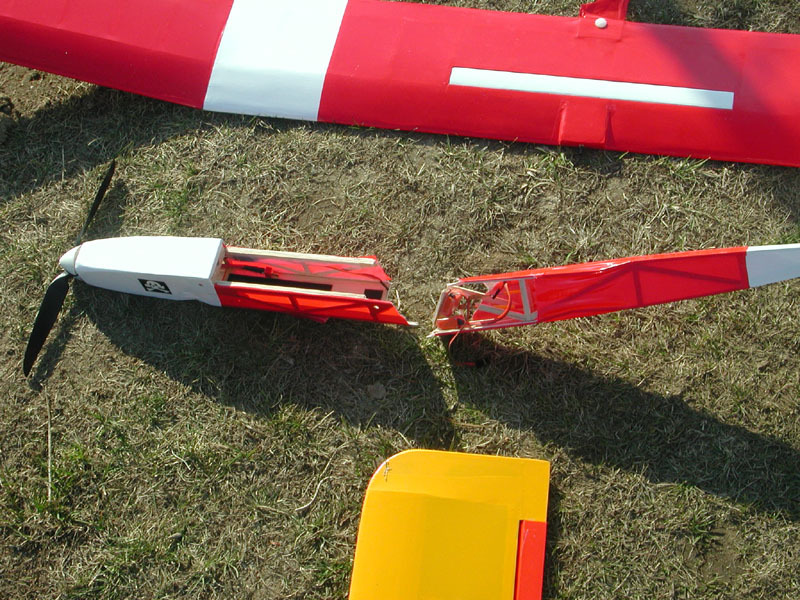 The wing was damaged but repairable. Kwik-E was a victem of my stupidity. 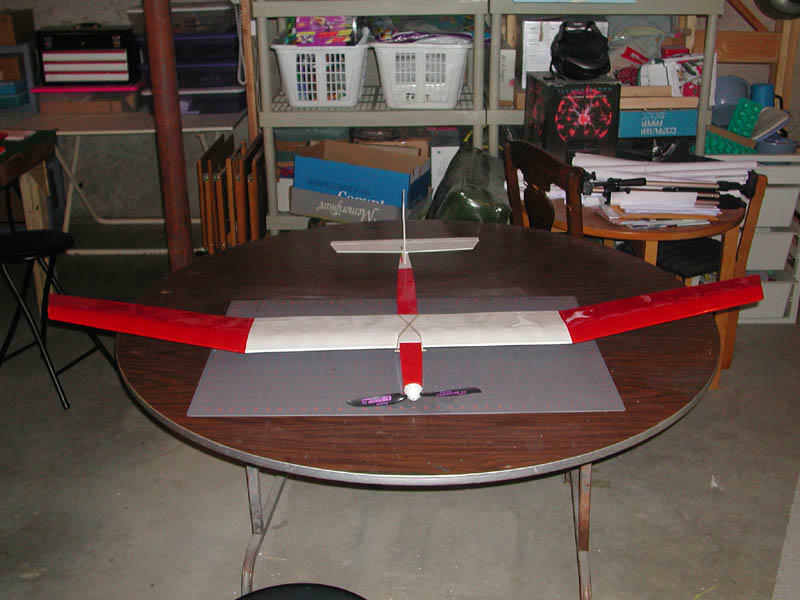 New Soarwatt wing is ready. Extended 6" in span from original plans. C-tube sheeted and spoiler added. Waiting for the snow to clear to try it out. 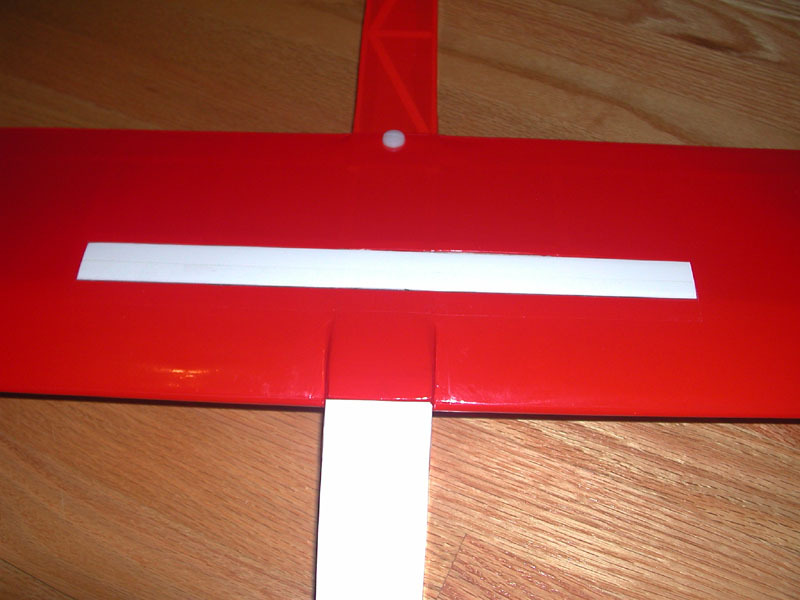 Fuselage is finished and leftover Dymond Flipper wing mounts up great. 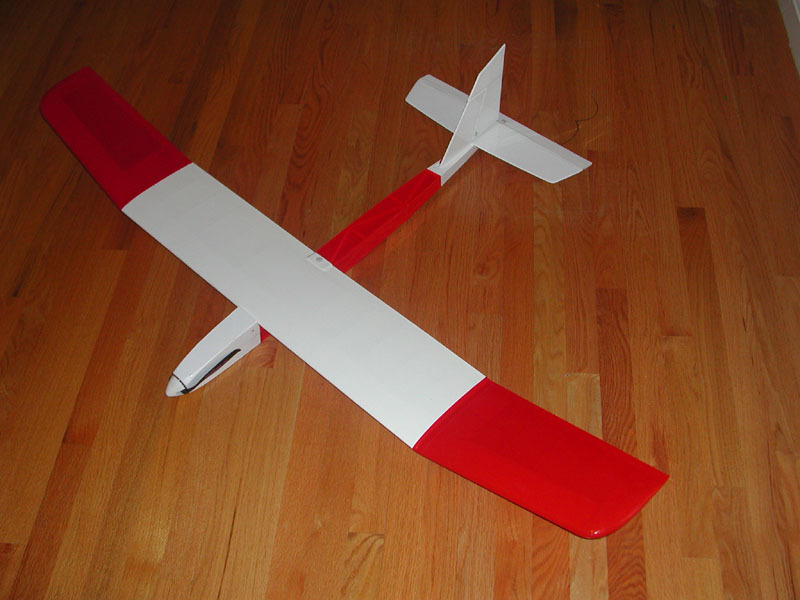 As soon as the weather clears I'm ready to fly this one. 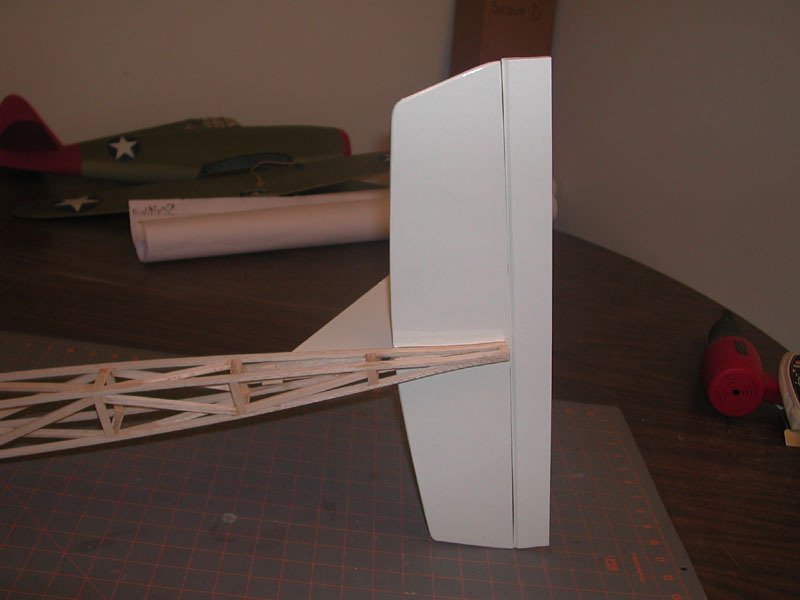 I'll start working on the Soarwatt extended wing soon. Started work on my replacement for Soarwatt #1. This one has the tailfeathers enlarged about 10% so I can experiment with different wings. I added a ply plate at the LE mount point and at the TE for a hold-down bolt. I kept the mounts for dowels as well so I can use either wing mounting method. 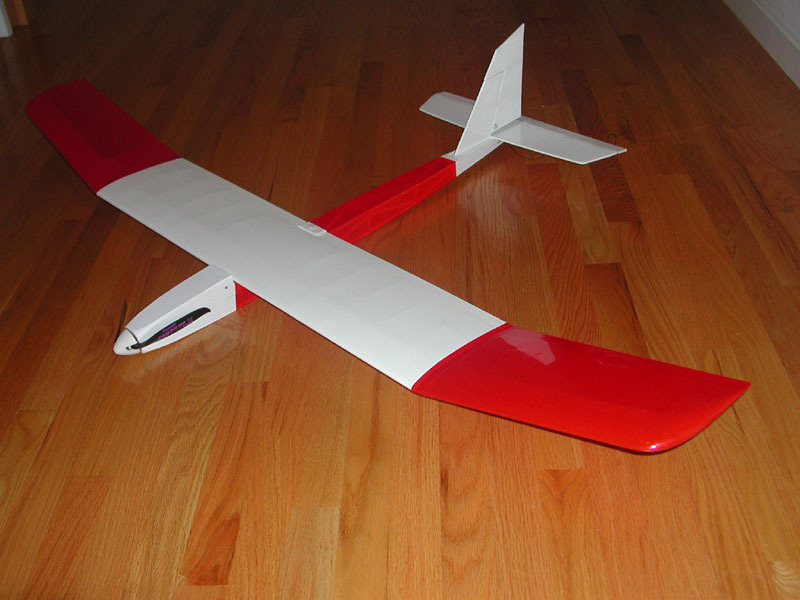 Power will be my Astro 020-P 4.44:1 with Graupner 11x8 CAM folder, same system as #1. 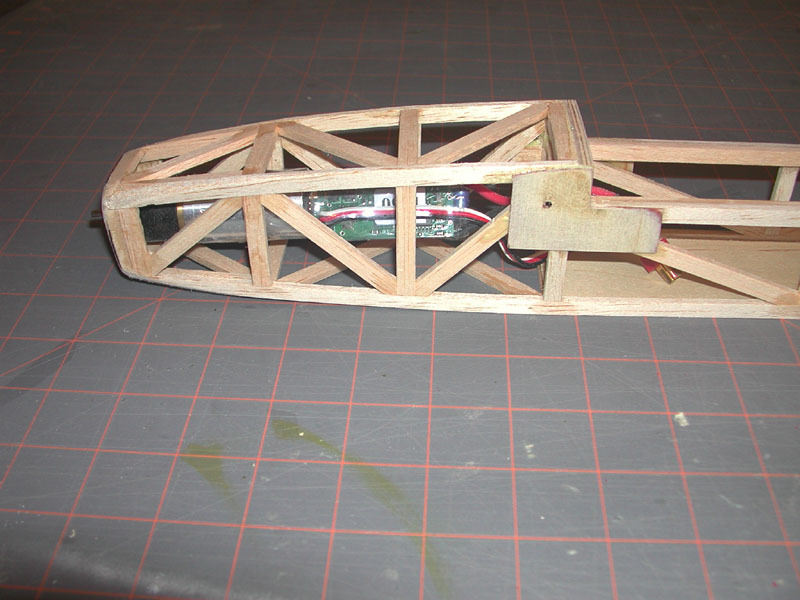 Other improvements include a 1/32" ply plate for the battery bay floor and small 1/32" ply plates for the servo mount points, which were a weak point on my first Super Soarwatt. 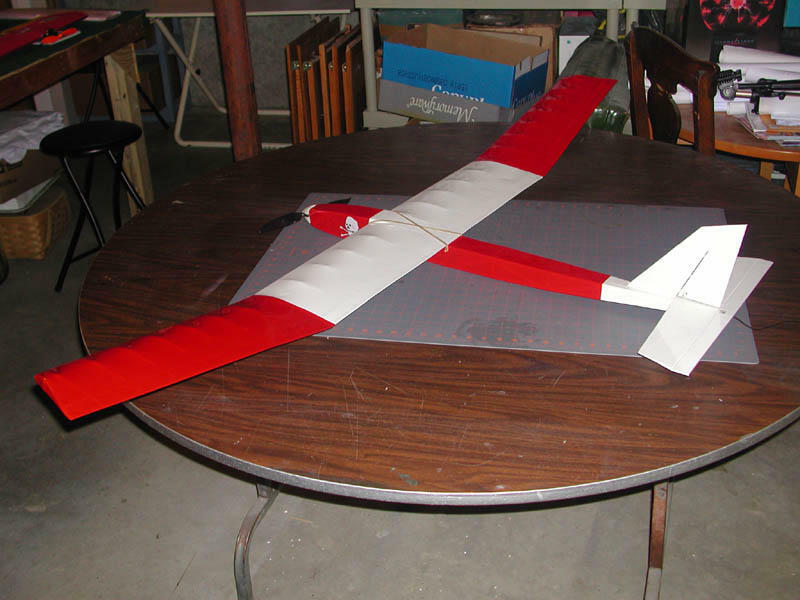 The first wing it will use (shown in the photo above) will be the wing from my now deceased Dymond Flipper ARF sailplane. 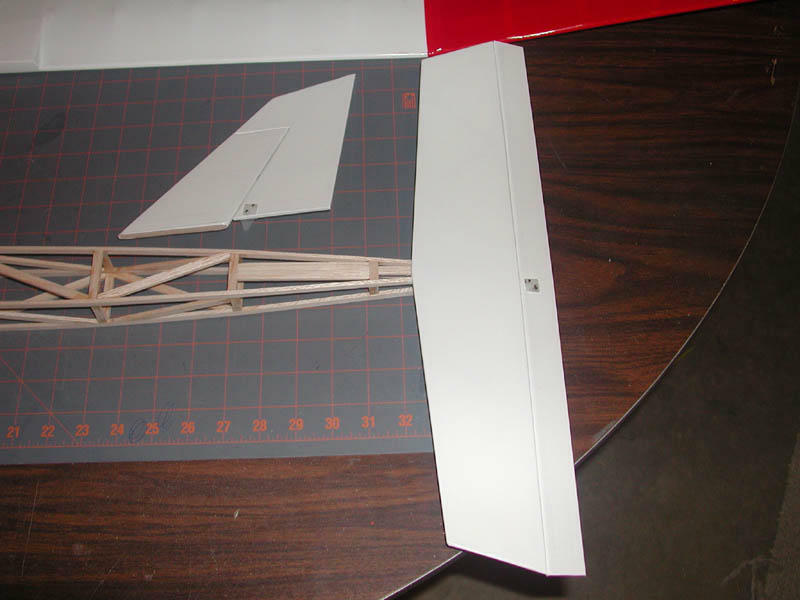 After I finish the fuselage I'll be making a 'special' wing for it from the Soarwatt plans, only this one will have sheeting from the spar to the LE, and possibly spoilers. May she rest in peace. Lost radio control over the field. 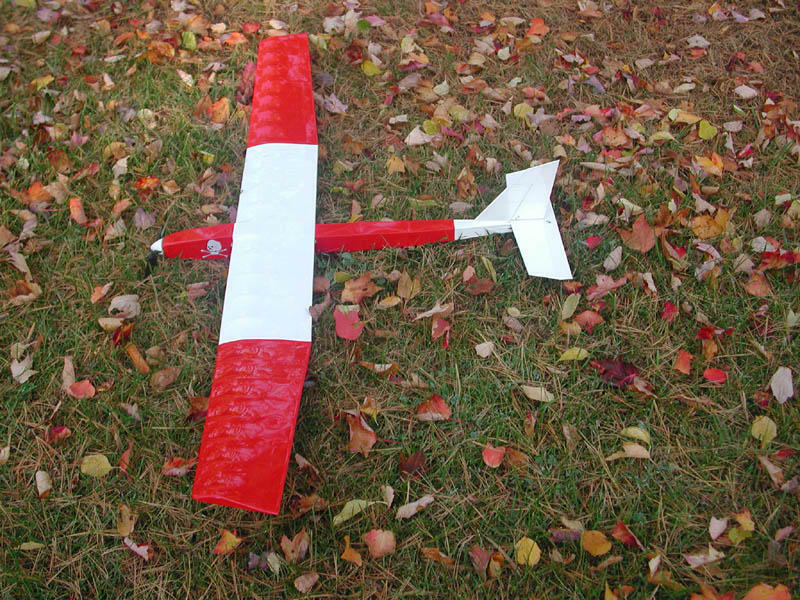 The soarwatt rolled on it's back with the motor on full in a 45 degree inverted dive. 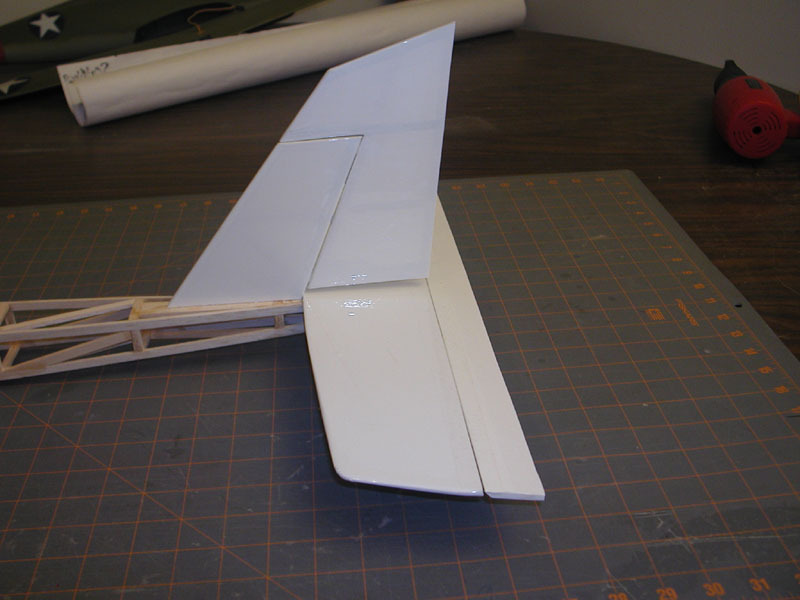 The fuselage pretty much disentegrated on impact to the tailfeathers. 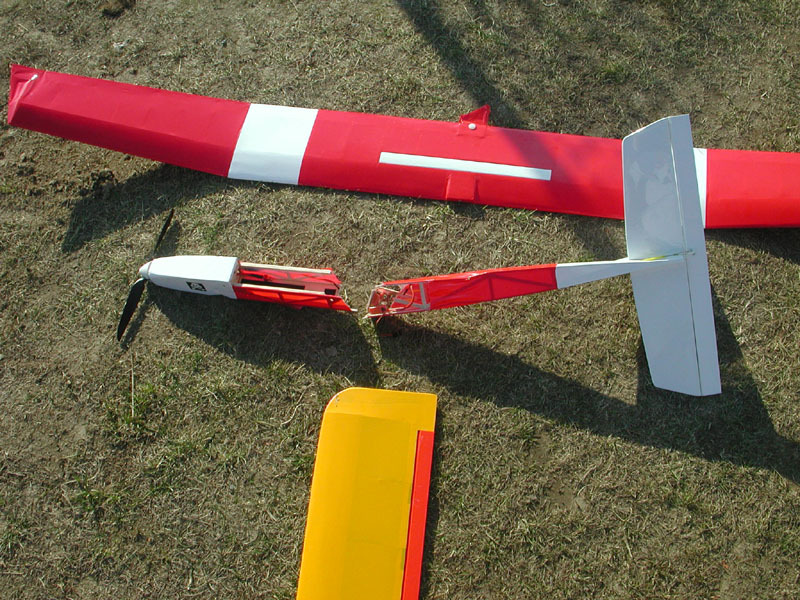 The wing had major damage. I fished the gear out of it and gave the remains to a club member who will salvage the tailfeathers for one he's building. 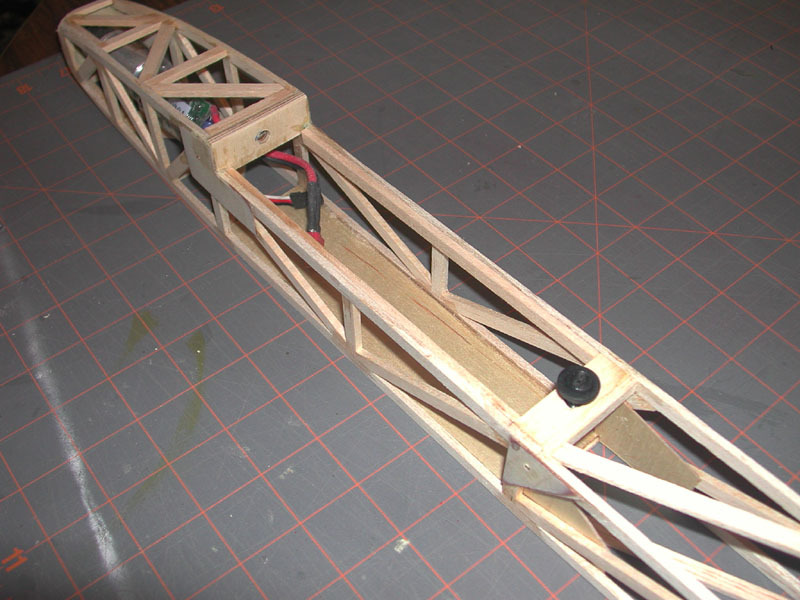 When I removed the gear I found that the elevator servo was mounted to a stick that had broken loose - probably the source of all the flutter that was giving me so much trouble. This will be an area that will need some reinforcement on the next soarwatt. I'll start a new Soarwatt this winter. 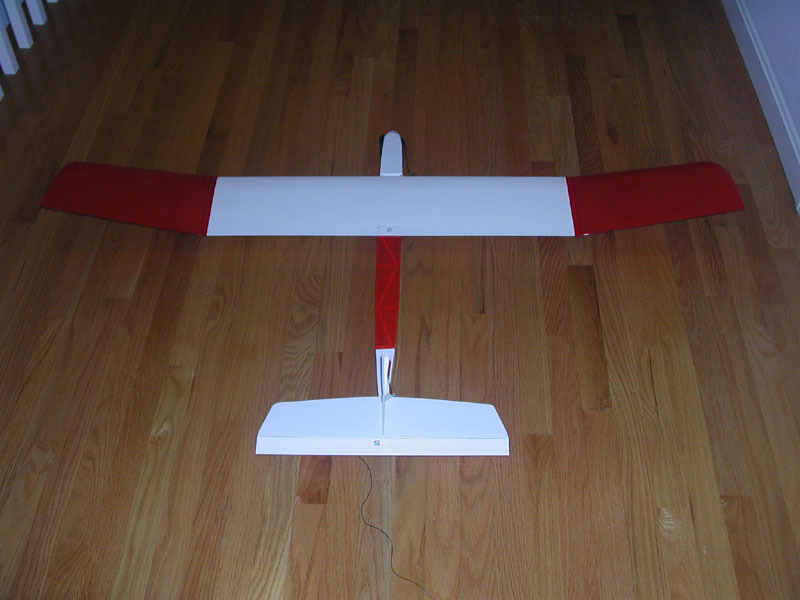 Flew the Soarwatt with the buddy cord to teach a new member the basics. During the flight I had a really bad case of wing flapping in the wind. 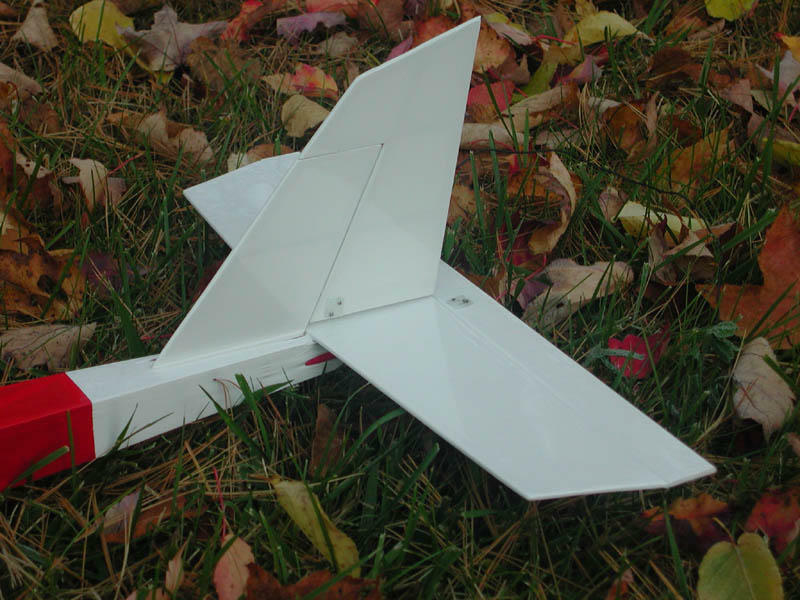 The wing got in a harmonic state and wouldn't stop flapping. 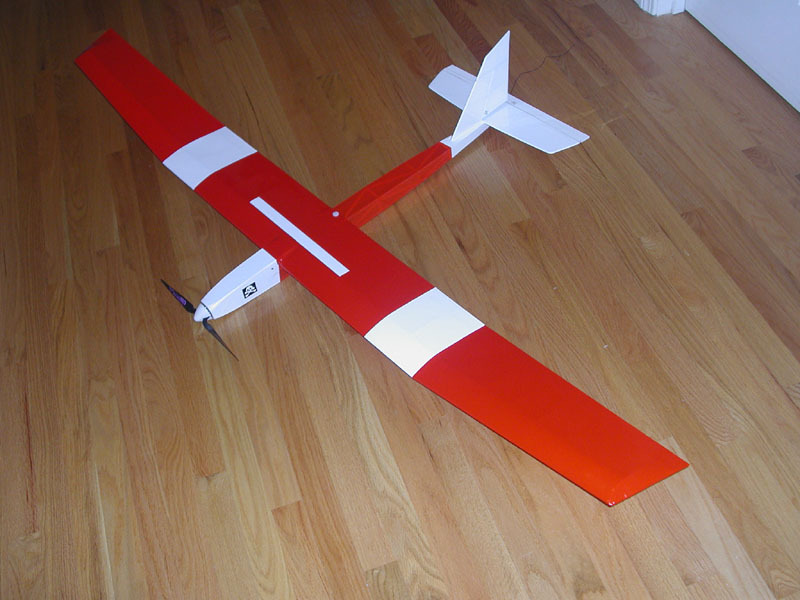 Under my control it did a semi-controlled glide into the woods. Took a while to find it, but it fell 60' to the forest floor with the only damage being a 1" tear in the fuselage covering. Talk about lucky! Back at home I fixed the tear, and re-covered the wing, since the covering on it was loose and wouldn't shrink anymore. This venerable old veteran is ready to go again. Cleaned the dust off the soarwatt from a winter's storage. 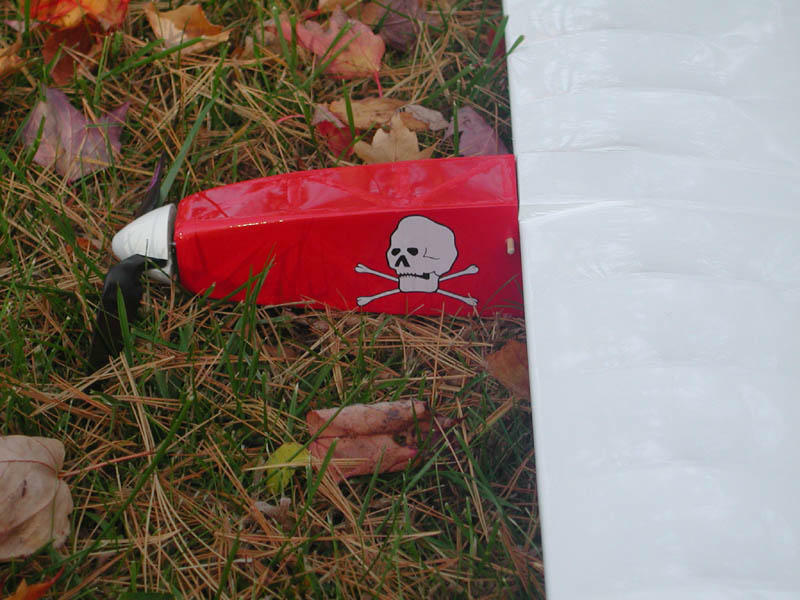 I ran the heat gun over the wing to re-shring the covering that had relaxed a little over the winter. I also noticed that the stabalizer had some play in it from a whole season's worth of abuse, so I re-glued it where it was loose. Everyone keeps telling me I can't treat this thing like a hotliner but I can't help myself....maybe it's the nose-art? 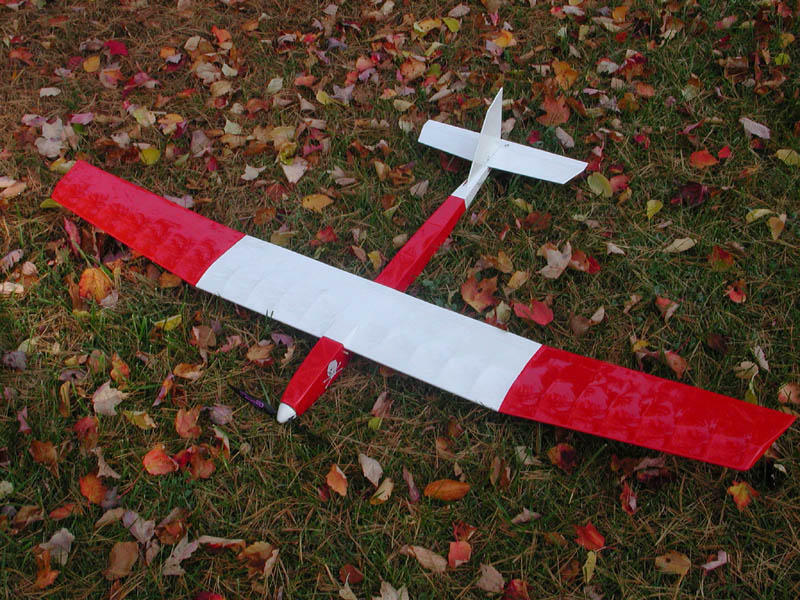 Flew at the club field tonight with a anothe soarwatt and some other people. This plane is still one of my all-time favorites. Adjusted the downthrust last night. I flew at lunch and the correction was just about perfect. The plane climbs under power some but doesn't baloon anymore. What a blast. I flew around 25 minutes on one 8x1100 NiMh pack! One charge per lunch break - now that's a change from the 5 battery pack lunches I have with the Zagi! 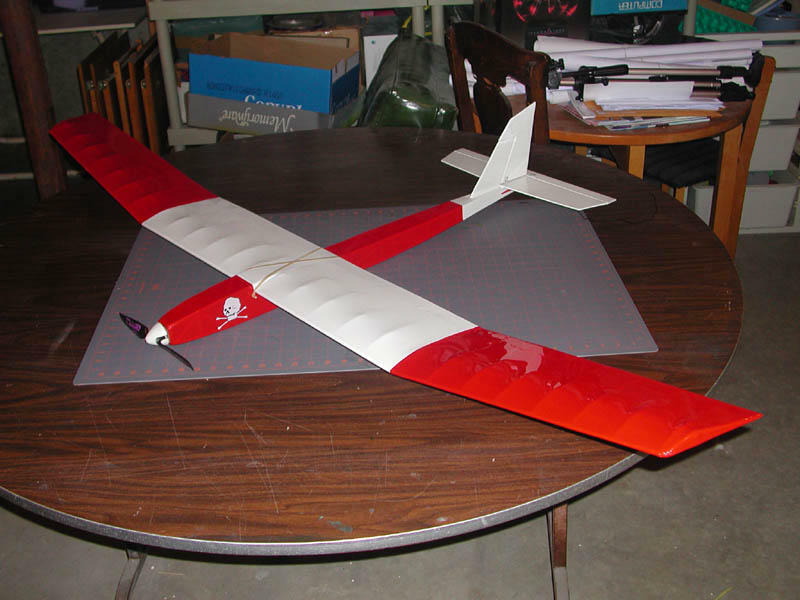 Flew at lunch - only needed a click or two of trim to fly great! 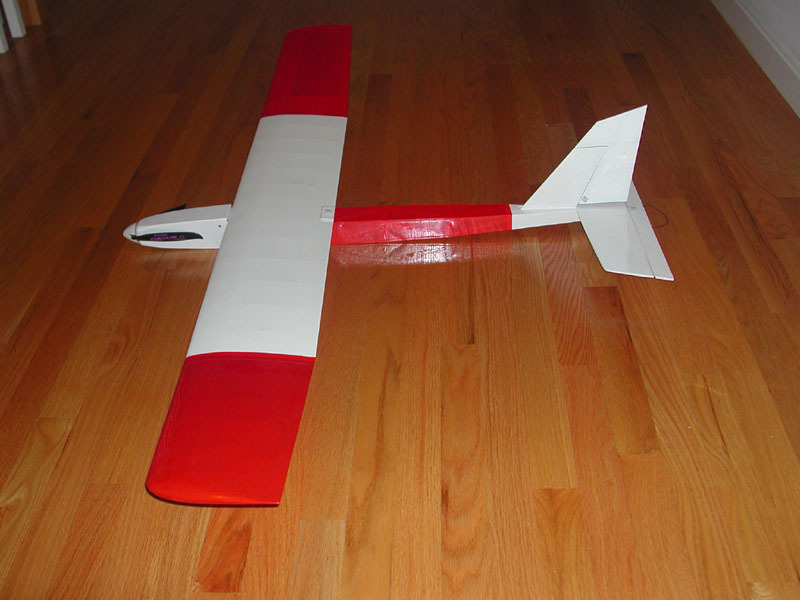 It does need some more downthrust - probably more than stock since my powerplant is brushless and has WAY more thrust. Will adjust but still it soars great! Went to local hobby shop (60 mins each way) to get some pushrods since mine were backordered WAY too long. Installed them and finished covering. Set TX up for correct throws and some exponential. 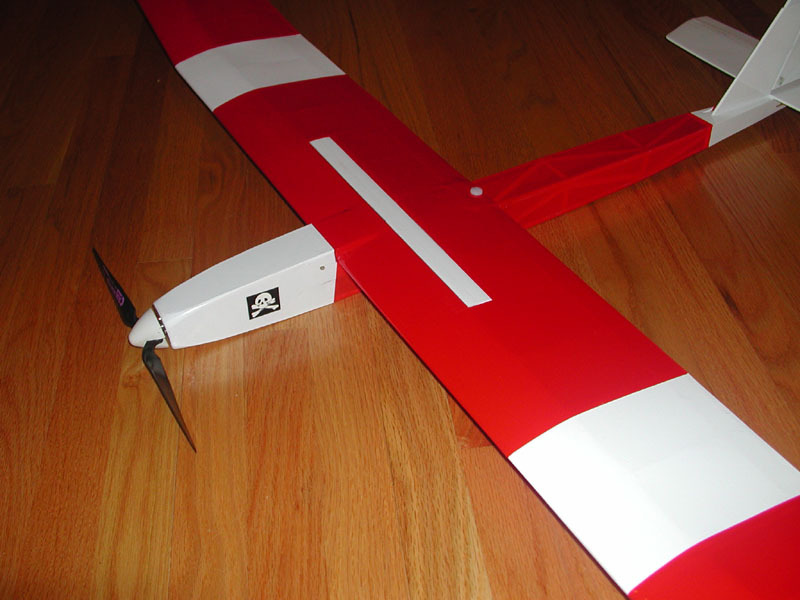 Ready for maiden flights. 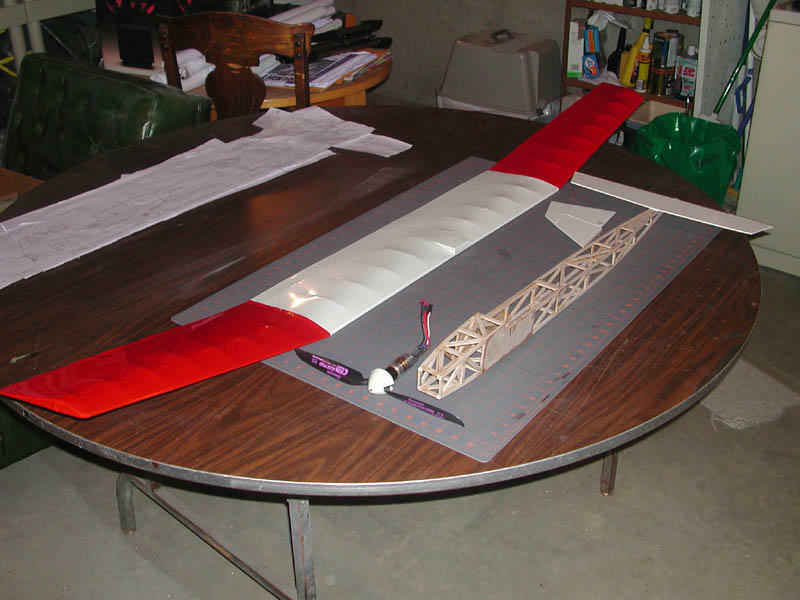 Construction progress photos of my Modelairtech Super Soarwatt. Built from plans. Power will be provided by an Astro 020P with 4.44:1 planetary gearbox driving a 12"x8" Cam Folder. Wing is covered, as are the tailfeathers. Awaiting delivery of pushrods and clevises to complete construction.